Sealed motorcycle batteries are a fantastic invention. Motorcycles usually have a minimum of space under the seat or tank, and the battery is sometimes located deep down under the seat, the frame or even the computer. “Out of sight, out of mind” is the saying, and it’s too easy to forget about the battery and the necessary maintenance when it’s not out in the open. Sport bikes or touring bikes with acres of fairing can also make it very hard to check the battery. Some motorcycles have their battery so well hidden that it becomes impossible to even check the water level without spending 1/2 hour or more tearing apart the bike. Who needs that? 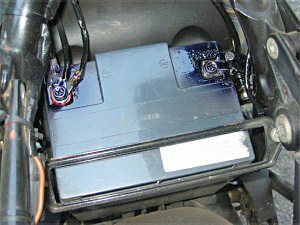 The first thing I do whenever I buy a used motorcycle (and so far I’ve only purchased used bikes) is to replace the battery with a new sealed unit. This allows me to establish a battery performance baseline – my experience with batteries in both motorcycles and cars has taught me that I can count on the battery failing about one month after the warranty expiration date. Installing a sealed battery eliminates a routine maintenance task. But even sealed batteries need to be checked occasionally. I’ve found corrosion can occur on the battery terminals within just a few months. I didn’t ride much this past winter, and I was surprised to see lots of corrosion around the terminals on two of my bikes. My dad used to coat the terminals with petroleum jelly, and I suppose it worked. Back in those days, a car owner was under the hood on a regular basis, making it easy to forecast battery problems and keep an eye on the potential for corrosion. With the extended service intervals on motorcycles and cars today, it’s easy to forget and a small problem can suddenly turn into a big one. It’s possible to clean the battery terminals with some baking soda and water solution, but I’ve found that this Permatex Battery Cleaner spray works just as well and it’s quicker and easier than mixing up a batch of baking soda. Who has baking soda around anyway? Permatex Battery Cleaner (spray can, ~$6.50) creates a foam that coats the terminal and dissolves and neutralizes the corrosion. The directions call for cleaning the terminals with water to wash off the residue, but I usually just spray on some Glass Plus (I always have a container handy in the garage) and wipe it off with an old paint brush and a paper towel. The Permatex product does a good job and it works quickly, and a single can will last virtually forever. After the terminals are dry, I coat them with Permatex Battery Protector & Sealer (~$7.50). This is a blue liquid that is sprayed on and around the terminals to protect them from further corrosion. The only drawback is that it doesn’t seem to completely dry, so there’s always a sticky residue on the terminals to collect dust and dirt. But it seems to prevent corrosion, and that’s what counts. It’s hard to see in this photo, but the terminals are coated with the Permatex Protector & Sealer. This photo was taken about 60 days after the products were used, and there’s no sign of corrosion. I use Permatex Battery Cleaner and Permatex Battery Protector & Sealer on all of my motorcycles and automobiles. Both products can be found in most any automotive parts store, usually at a good discount. If you haven’t checked your battery in a while, now’s the time to do so. If your existing battery needs cleaning or you’re installing a new one, the Permatex products can help make life just a little easier. Review Date: June 2006 Made In: U.S.A.